If you had the misfortune of listening to Chris “Mad Dog” Russo’s appearance on WEEI this morning, you may well feel, as I do, that you lost 20 IQ points from the exchange. Kirk Minihane and Gerry Callahan did a good job challenging Russo, who would not hear or acknowledge any of it. He screamed for the entire segment. I know that’s his schtick, “Mad Dog” and all, but WEEI probably should’ve just hung up on him when Russo admitted that he had not read the Wells Report. He also said he will not read the Patriots response at WellsReportContext.com. What’s interesting is that you can take this segment and pretty much get the entire national view of deflategate (God, I hate that term) from Russo. How he feels is how much of the nation outside of New England (and plenty inside New England too – just read the letters to the Globe). MCNALLY TOOK THE BALLS WHEN HE WASN’T SUPPOSED TO AND BROUGHT THEM INTO THE BATHROOM!!!!! OF COURSE HE WENT IN TO DEFLATE THEM!!!! HE CALLED HIMSELF THE DEFLATOR!!! McNally taking the balls to the field was what he did, and no one in the crowded room thought it unusual enough to ask him what he was doing. As for the bathroom, he was in there for 95 seconds. What’s more plausible – that he actually used the facilities, or that he went in and took air out of all the footballs in that time? Remember, a team of officials did not have enough time to gauge all the footballs at halftime, but he could do this? The “deflator” nickname was from a May text. Russo made it sound like McNally took the balls into the room, did his thing, and then sent out a text calling himself the deflator. Russo, like all of America, has latched onto the “deflator” text, without knowing any context. They know the Patriots rebuttal said it referred to weight loss, which was dismissed by most people as ridiculous. It may be ridiculous, but if it were made up, you’d think the brains down there would’ve come up with something slightly more plausible. Former Patriot Matt Chatham has said that it was very common for staff at the stadium to have had weight loss competitions in the offseason. “Deflation” is a fairly common term used by weightlifters (and steroid users) – who knows? On the surface, it is a damning term when used in this case. Being unwilling to look at context (there was a second text using deflate and referencing a JKT.) is lazy and intellectually dishonest. But that’s what most HotSportzTakers are, right? TOM BRADY HAS NOT SPOKEN ON THIS TOPIC!!! HE DIDN’T HAND OVER HIS PHONE!!! IT MEANS HE’S GUILTY!!!! Pretty much his entire case is built on this. Brady hasn’t come out, guns firing and denied this, so he’s guilty. Guilty. Guilty. GUILTY. Did these guys not notice that Brady hired the biggest anti-NFL gun out there in Jeffrey Kessler? When Brady does his talking, it will be final. He’s taking the legal steps to defend himself and at the same time punish those who made those allegations. Mr Brady will be heard from. As for the phone, why can’t people see it was an NFLPA thing? Stephen Gostkowski also refused to hand over his phone. Where’s his suspension for non-cooperation? The sad thing, Russo is speaking for much of the country with his takes here. Those two points, he just screamed over and over and over again. No pause for reason. That’s what most other fan bases are doing as well. He didn’t even read the reports. Did Deflated Footballs Really Give the Patriots a Fumble Advantage? Otherwise, you summed up the interview to a T.
How can any semi-intelligent human being not understand that Brady can’t be making talk show rounds? Good lord, is Russo really that moronic? And asking why Goodell would want to suspend Brady? Oh, I don’t know, Chris, maybe the fact that your precious 80% of the country now wants to make him president-for-life might have something to do with it? Maybe someone should remind the professional trolls on Morrissey Blvd. that the Pats won the Super Bowl three and a half months ago. “Demise” is not exactly an accurate term, at least not right now. Man, the Globe really can’t stand the fact that football has become so popular in this town, can they? I don’t have feelings on that subject either way. I still love the Red Sox and still catch them whenever I can on TV; whether the Pats, Sox, C’s or B’s are the most popular team in town at any given point in history is totally irrelevant to me. I love them all and root for them all with equal vigor. 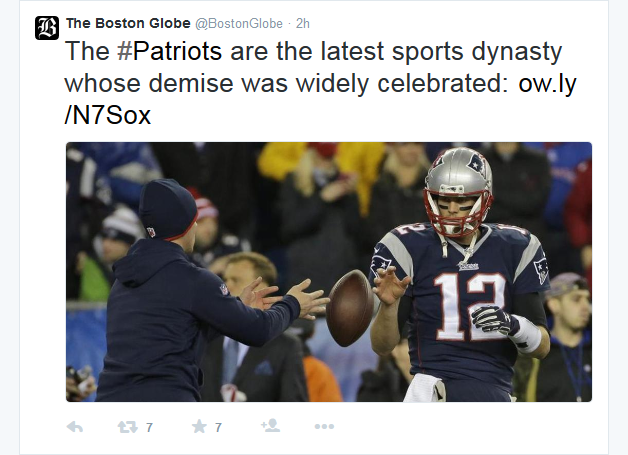 The Globe just can’t seem to get past the whole Sox/Pats thing, and it’s not just because Henry owns them, and it’s not just because the NY Times owned the Globe and a piece of the Sox at one time either. They were pulling this schtick before either of those transactions occurred. Remember the post-2004 World Series online poll they conducted which rated the Pats’ SB 36 victory ahead of the Sox World Series victory? The Globies came out in full force arguing that Pats fans had “rigged” the poll somehow, because they simply did not want to believe the results. This has been a bug up their collective butts for a long, long time. I just don’t get it. Listening to it now…it’s STUNNING. Unbelievable. He actually says Aaron Rodgers saying he likes overinflated footballs is not actually proof he likes overinflated balls. My head exploded. I don’t have words. People listen to this guy? Like, seriously? There are people who listen to this man? HE WENT INTO THE BATHROOM!!!! Over and over and over again. Saying it’s embarrassing that Dino, Kirk, Gerry ignore that fact (that he screamed about 25 times) but it’s not embarrassing that he REFUSES to read anything? Suddenly Felger and Mazz aren’t so bad. It’s funny, because of the two New York blowhards (Mike and the Mad Dog from WFAN fame years ago), Russo was usually the one who was willing to take on some New York sacred cows, while Francesca was pretty much a lickspittle. I’ll never forget Parcells’ debut “conference call” with the media after the Jets tampered with, and finally hired him away from the Pats after Tagliabue decided upon compensation for NE. Russo was the only one in the fawning NY media crowd willing to ask Parcells why Jets fans should trust him “given his history of running out on teams.” Tuna acted like he didn’t hear the question because of the audio difficulties with the speaker phone, so Russo, undaunted, jumped up, walked over to the speaker and repeated the question. Good stuff. I’m sure Francesca, a Parcells toady from way back, was enraged. Too bad Russo has decided to take this tack with the Patriots’ situation. Maybe if he bothered to read the report, and the Pats’ rebuttal, he’d change his mind about a few things. You get almost no ratings being on satelite radio. Stern went from around 10 million listeners to maybe 200,000. what do you think a gimmiky sports show like him grabs in comparison? Exactly. Next to nothing. This was the ultimate troll job for more listeners. Even if they are “hate listeners”. I just want to double down on that Above The Law article. It is a MUST READ. By far the best analysis of this debacle I’ve read to date, from a legal perspective. But it’s lots of words! Waaahh! CHEATRIOTZ!!!!! Great job on the Brady not speaking piece in particular, Bruce. I haven’t understood this from the beginning. – Brady spoke for 45 mins before the Superbowl. NOTHING that has happened since (The Wells Report, Don Yee’s media blitz, Patriots context site, etc.) even remotely contradicts what he said then: He says he did nothing wrong. – There is nothing to gain, at all, from speaking publicly. Not a press conference, not a statement, not a Salem State appearance… nothing. Wait till the appeal is complete and then assess when/how you speak publicly about it. Media needs to understand this. Just a note on coverage of the Kraft presser, since we’ve got cable @ the office: All locals switched to it. Nationals: only noticed CNN (no HLN, FNC or MSNBC). ESPN. As for sports, obviously CSNNE went to it. NESN, surprisingly, cut into a weed whacker infomercial and is airing. Are you f-cking kidding me? The team will accept it’s punishment in lieu of Brady having none. Otherwise, what’s the f******* point? The problem is that the draft picks are far more valuable than losing Brady for a couple of games, especially the #1 pick. The team would probably go 2-2 with Jimmy G. under center, maybe even better. This is a criminal act on the NFL’s part as far as I’m concerned. It’s outright theft of draft capital, and Kraft is letting them do it. Oh, and now we can look forward to an infinity of “Cheaters” and “Tainted Super Bowls” talk from the media and opposing fan bases, because the Pats failed to stand up for themselves against this Banana Republic of an NFL office under the rule of that Ginger Jacka$$. I can’t even see straight right now. Yes, and Brady has a great case and one of the best lawyers in the country. He will sue and have the suspension overturned in court. This may save Brady some legal fees (provided there is some deal) but otherwise is not a good outcome for the Patriots. Shocked that he caved. Completely shocked. I’m sure this will buy him a lot of goodwill amongst his fellow owners….you know, just like rolling over and accepting the insane Spygate penalties did. I hope Brady burns the damn league to the ground now…Kraft can’t stop that. BB must be pi$$ed. His owner just let Goodell steal two valuable draft picks from him based on absolutely zero credible evidence. Disgusting. Now the haters and the media have their several pounds of flesh…..”they didn’t fight it because they know their guilty…they know they cheated….tainted titles!! !” ENRAGED. “they’re guilty”…not their. Hate it when I do that. Kraft fell on his sword for Brady? Doesn’t mean TB12 is guilty of anything (he’s not, IMO) but it means something…..has to. He fell on his sword in 2007, too, over a misdemeanor rules violation. How has that worked out for the Pats in the long run? More witch hunts will follow, you can bet your life on it. The other teams are now emboldened to do what the Colts just did whenever the mood strikes. Um, two Super Bowl appearance and a title? What ramifications were there? The ramifications are their “reputation as cheaters” which is always….always….cited, and was cited constantly during this whole “deflategate” mess, AND was cited by Troy Vincent as part of the reason why they were slammed so hard over this thing, even though the league’s own report exonerated Kraft and BB of any wrongdoing. The ramifications are that the NEXT time some jealous, crying, vanquished opponent wants to catch them on a technicality, their “reputation as cheaters” will result in yet another media firestorm and another draconian set of penalties, evidence be damned. This is a BAD move on Kraft’s part. If you let yourself be bullied all the time, the bullying is just going to continue. Also, how many Super Bowls would they have won if BB had two first round picks in 2008 instead of one? He would have, but Goodell stole the other one over Spygate. Maybe that stolen draft pick would have been the DB or the DE who makes the game-clinching play in SB 46, or forces three turnovers in the 2012 AFC title game. We’ll never know…just like we’ll now never know just what the Pats are losing by not picking in next year’s first round. There’s simply no way to sugarcoat this. It’s a terrible, terrible decision IMO. And trust me, the other owners aren’t going to appreciate this. It’s only going to embolden more behavior like we saw out of the Ravens and Colts this past January. Mark my words. I agree with your general points. On the other hand, if I’m Robert Kraft, I have a billion dollar asset that generates hundreds of millions of dollars of revenue for me a year. If the cost of fighting all those preconceptions you list is shaving 30% off the value of my team due to the damage that litigation would cause both the franchise and the league…. I sit back and take it. I understand where he’s coming from vis a vis a business standpoint. I really do. And as fans, we have the option of watching the games on TV with the sound turned off and the local radio broadcast on in the background so that we don’t have to hear the Simms’s and Collinsworth’s of the world constantly bring up the “complicated legacy” of the team for here ever-after. We also can avoid ESPN, the NFLN and the troll-filled message boards. The major problem I see in all this is the precedent it sets. At least with Spygate, you could argue that the Pats violated a rule and there was hard evidence to back it up. The punishment was far, far, far too severe for such a miniscule rules violation, but at least there was proof. In this case, you likely had two rival teams scheming along with anti-Patriots league officials to set up a sting operation based on nothing but hearsay and operating in complete ignorance of the laws of physics. You then had the news leaked to a rival team’s media outlet by a rival team’s owner (Irsay to Kravitz), and that resulted in a two-week media sh*tstorm before the biggest game of the year (kudos to BB and the coaching staff for keeping the team focused…utterly amazing). That, in turn, resulted in a $5M hit-job of an investigation run by the league’s favorite lawyer. That, in turn, resulted in the most draconian penalty EVER assessed against an NFL team, despite the fact that the owner and the head coach were exonerated by the report on which the penalties were based. This is the real problem with Kraft’s capitulation…….what is going to stop the Colts, Jets, Ravens (pick the team) of the world from doing this again? What’s going to stop Kensil and his anti-Patriots cabal in the league office from allowing it again, especially since they know damn well that ANY accusation against the Pats is going to be treated as gospel by the pathetic media? Unless Kraft extracted a promise from Goodell to keep crap like this quiet in the future, this is a total loss for everyone involved — unless you’re a media maggot and a fan of one of the other 31 teams. Maybe they beat the Giants in 2010 if they have a first round cornerback playing in his third year in Belichick’s system. Kraft said to trust him so I will. Who knows what is going on behind the scenes? 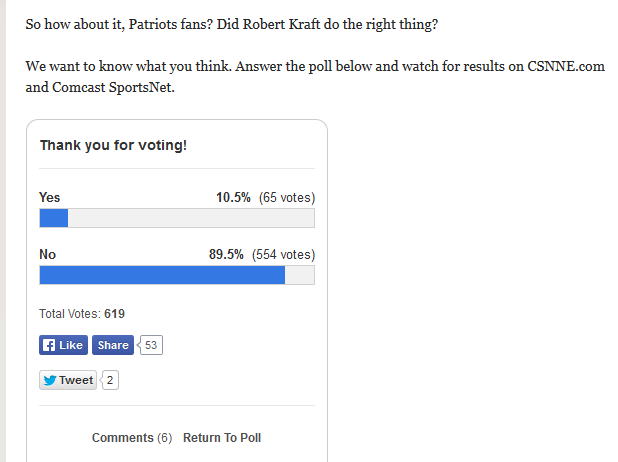 Kraft was right about the public debate. Pats supporters will support them. Pats haters won’t. Doesn’t mean he’s not working on something out the public’s view. I think in the end Kraft was stuck between a rock and a hard place. He knows no one did anything wrong in his organization. He also knows that they did do something wrong 8 years ago at Spygate. There was irrefutable evidence that BB had the opposing signals taped. So now he is forced to prove a negative. We all know Wells report is moronic and proves nothing. The problem Kraft has is credibility. He only had 2 options: sue or cave. He does not want to be Al Davis, he enjoys being this influential owner, head of the TV committee, loved by his fellow owners. So he caves. The mistake he makes is that his fan base will feel that we were let down because he was not willing to fight for us. It does not appear that he extracted anything from the league in his cave. So all the anger, the Context website, all seem to be a PR move directed at NE fans. In the end the license to print money is more important than doing what is right. This is not over. Kraft will have to deal with the fall out of his decision to not stand and fight for what is right for the rest of his life. When Brady sues and wins then Kraft will look smaller than his already diminutive stature shows. If I still had my season tickets I would be giving them up right about now. Luckily for me I gave them up a while ago because the kids came first. Still his capitulation turns my stomach. Either you have principles and morals or you don’t. Clearly Kraft does’t. Instead for him this is all about power, prestige and keeping the printing press on. Have to think you’re right here. Look at the # of scandals, lately, and fans keep tuning in/paying. It’s the only league, now, where inept ownership means nothing. The thing that will really exacerbate this if, a year from now, we hear that Boston will be getting a NFL Draft or Superbowl. I’m not sure Kraft had the backing he thought he did. This reminds me of when the Celtics asked for salary cap forgiveness for Reggie Lewis. The other teams hated the Celts so much, they refused to give it to them. I remember hearing one organization/owner admit years later that they were wrong to do that. That was horrible, and it was magnified by the fact that a few years later, Stern gave the Knicks salary cap relief because one of their players got HURT before the season began. I can’t remember all the details, but I know he gave them relief over an injury–not a death, an injury. My only quibble is that why not appeal it anyway??.. I am sure he was told blatantly that he would lose… but at least he could say he fought the good fight. I doubt anyone sane would really begrudge him if he decided not to sue at that point. That was some of the worst radio I’ve ever heard in my life, but I can’t really use the term “unlistenable” because I of course listened. He is an absolute embarrassment. Love them or hate them, I guess we’re spoiled up here with the level of professionalism all of our big name radio guys have typically had. Sports talk radio circle jerk today. the celebration on air when the penalties were announced was absurd, sad and embarrassing. i get it. people hate the pats. but you’re a grown man doing cartwheels over something that, ultimately, doesn’t impact you one iota. the response to tsarnaev was more muted than his to brady. In his circles the goings on about the league do not mean anything. They are just interested in the huge amount of money they are generating for each other. Integrity can be bought, fan loyalty is just a marketing tool, we often forget that sports are entertainment or more important a business. The fans are a line entry. Kraft made the decision that getting along with the 31 other billionaires was more important that doing what was right for his fans. For 20 years Kraft has been THE model owner in the NFL. In one press conference he throws an awful lot of that built up good will away in a pitch to placate and get along with the other owners. I think it was a horrible tactical move and more importantly I think it was horrible local business decision. I am not naive enough to think that the NFL will be any less popular tomorrow, not in the rest of the country or in New England. 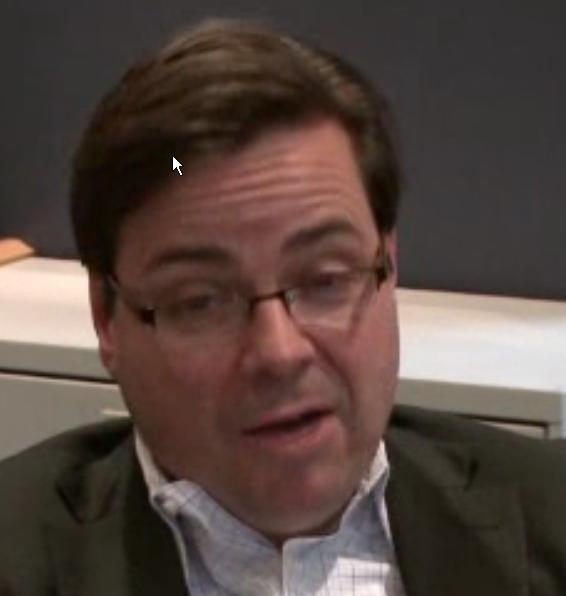 I do think that Kraft did what the rest of the league has been trying to do…take the sheen off the franchise. As I said in another post, I would give up my season tickets…I doubt others would but I am like that when I do not think my business is appreciated. I will say that I will think twice before I buy Pats merchandise for my kids or nephew. Does not mean I will not buy it, it means that the “cool” factor does not exist for me any more. Patriots colors and laundry have been a badge of honor for the past 15-20 years. Now they are just another licensed product that is over priced and as my wife says “a costume for grown up boys”. Thanks Bob Kraft…it is all because of you. Let’s just hope Kraft leaves no stone unturned as he goes after the Colts, the Ravens and 29 other teams, as far as I’m concerned. Make certain those mind-numbing hypocrites dot every I and cross every T from here on out. I live a long way from MA and it’s brutal being a Pats fan elsewhere in this country. None of the Patriots rings are valid and Brady has proven to be a liar and an average QB who needed to cheat in order to succeed.